As the American people face more division, corruption, moral decay, antipathy and direct challenges to our patriotism, we are heartened by what could be. 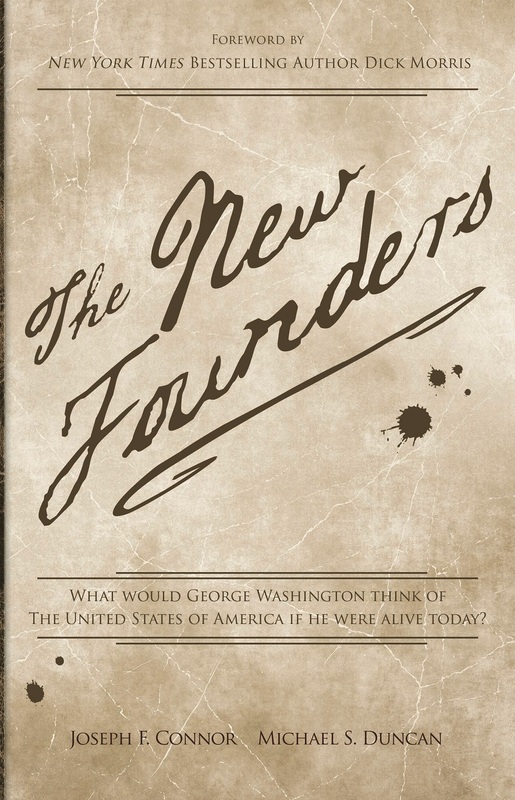 In Chapter 13 of The New Founders, General Washington, alive in 21st Century America, and today’s incarnates of the founders Jack Murray (Madison), Josh Anders (Adams), Anthony Hahn (Hamilton) and Tim Jenson (Jefferson) experience an epiphany during services at the National Cathedral and confirm Providence’s calling when George Washington quotes Abraham Lincoln on the steps of the Lincoln Memorial. The new founders had just experienced simultaneous epiphanies during the 7:15am services at the National Cathedral. George had asked to begin his Sunday in church and the men could not think of a more appropriate place for George to worship than in the exquisite house of worship. Using the minister’s words as her vehicle, Providence found the men sitting quietly in the back of the old Cathedral. 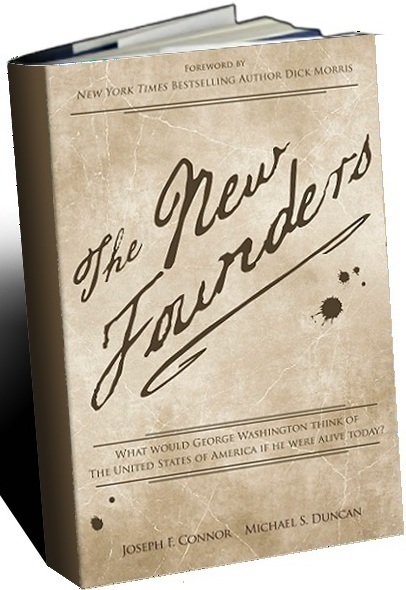 The nation’s recent birthday was the topic of the day’s sermon and, accordingly, the minister discussed how our country was founded on Judeo-Christian values, documented in the Declaration of Independence, the Constitution and Bill of Rights, and reflected in the laws, customs, and mores of our everyday lives. She preached that the founders knew that our civil society would only stand as long as the citizenry maintained such values. Without those values, our republican system would fail. The minister seemed to be looking directly at the five men as she began quoting the founders themselves. The minister continued, pointing to the recent examples of unwanted government intervention. She described agents, without parental consent, who confiscated school children’s brown bag lunches they deemed not in accordance with federal guidelines. She touched on the healthcare mandates, laws passed without being read by the lawmakers. She was in a controlled rant, railing how society had marginalized religious groups, language and icons in favor of secular symbols. The minister forcefully proclaimed that all of these godless policies must stop and be turned around immediately; that the country was in desperate need of a new leader, one who understood our country’s founding, one who was one with our people, one who would lead us back to the principles that brought us greatness. The four new founders were thunderstruck in their pews as the scattered congregation applauded. Each looked at the other, knowing that the minister addressed them and them alone. Each achieved inspiration as they focused on General Washington, his back straight, head slightly bowed, but eyes aimed forward in determination. The men stood outside of Josh’s limo at the bottom step of the Lincoln Memorial. With that said, General Washington looked up the steps of the memorial and led the men past a small number of early morning tourists to the summit. The father of our country was once again face-to-face with the larger than life President Lincoln. Mr. Washington walked to his left and studied the inscribed Gettysburg address. He then turned right and focused on Lincoln’s second inaugural. As George focused, he inched toward the middle of the rail and began speaking aloud, first directed toward the men and then for all within earshot. Mr. Washington reviewed the growing audience that built around him. He started to walk slowly toward the top of the steps and into the morning sunshine. While his audience grew, so did his ideas and the strength in his voice. Mr. Washington said he could see the steadfastness in Lincoln’s clinched fist and steely eyes. He described Lincoln as a man who may have bent during the horrific stresses of war but who refused to break. Mr. Washington was now on the top step of the Lincoln Memorial. He stood tall, erect and strong, as the crowd grew. Many cell phones were pointed in his direction, recording every word. One phone hoisted in the air to capture the moment belonged to Josh Anders. Even the park rangers moved in closer to listen. One even handed George his megaphone which he politely declined. He spoke extemporaneously, something not lost on the new founders. He paused as the waves of people soaked in one president’s words delivered by another. He needed to connect these words and show relevance in today’s world. Mr. Washington chastised today’s political class by pointing out that while DC had monuments to great men and women, there are too many monuments erected by government in honor of itself. He directly cited the colossal edifices erected for the Departments of Education and Agriculture. He questioned why anybody would have veritable monstrosities dedicated to bureaucracies called Housing and Urban Development. Hahn leaned toward Jenson and Murray and whispered that he felt like he was dreaming. The two men hardly acknowledged their colleague as they remained riveted on their new leader. By now, the crowd had surrounded Mr. Washington and the new founders. A number of well-wishers started to reach out and touch the first president, as if to ensure that he was not a mirage or a figment of their imagination. The General had whipped the mass into a near frenzy and his cabinet of gentlemen sensed it was time to depart. To Jack’s relief, Josh Anders took the initiative and quickly called his driver while motioning the men to surround Mr. Washington like secret service agents and lead him to the approaching limo. The crowd followed with thunderous applause as their chant of “MORE” echoed throughout the mall and within the Lincoln Memorial itself. As the group of men hurried to the waiting car, Mr. Washington stopped and paused yet again. He placed one foot on the floorboard of the back seat, stood tall above the crowd, and surveyed the scene. The crowd, having drawn silent when Mr. Washington raised himself up, erupted into a deafening cheer, followed by a rousing “USA” chant. The father of our country gave one last look around, smiled, and disappeared into the idling limousine. At once, the people rushed the car to get a look at the most powerful and mesmerizing speaker they had ever laid eyes on. But their looks were fleeting as the car sped away toward the Jefferson Memorial.